I, like I’m sure many others, like to eat when I’m bored. This therefore necessitates that I hoard several snacks in my desk in my office at work. 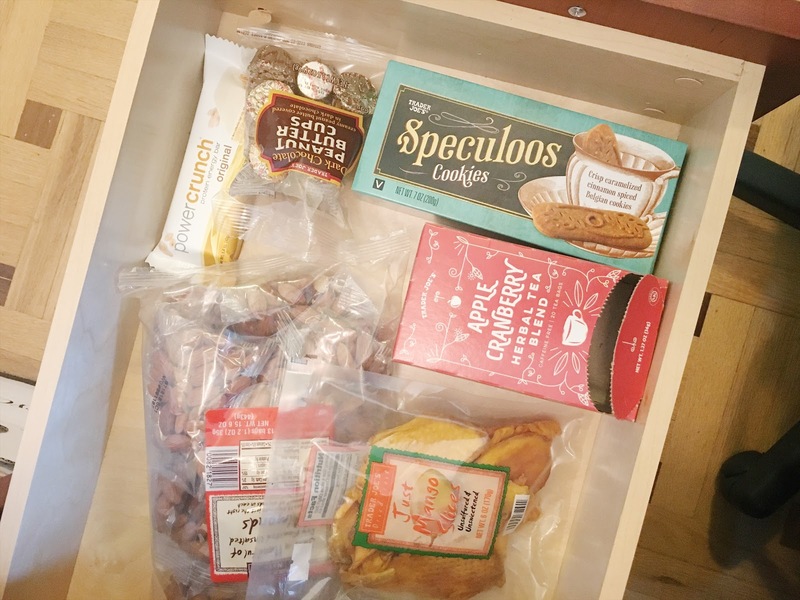 As I’m just starting at a new job and a new desk, I had to go out and stock up my desk drawers with my favorite snacks. After working full-time for over a year now, I have come to realize what works best for me. I think my snacks are healthy but still yummy and give me enough energy to get through long hours of document review. Most importantly, these snacks stop me from popping over across the street to spend $4 on a defrosted pastry at Starbucks. These were my LIFE when I was on Whole30. They are JUST ALMONDS which means no sugar or whatever. I asked my mom to buy me “dry roasted almonds” because I thought that would mean the same thing outside of Trader Joe’s, but you can imagine my surprise when I opened a pack of the “dry roasted” almonds and realized they were covered in seasoning including ONION POWDER. WHAT? The roasted unsalted almonds are literally just almonds. But they have a better texture than the “raw” almonds. Even though those are supposed to be healthier. TJ’s sells these “just a handful” which means they are in individually wrapped packets, which I technically don’t need as I am not going to be taking them around anywhere. But I have an issue with portion control so the wrapped packets are what work best for me. Ok, this is a messy one, but it’s so tasty. When I used to eat it at my desk in LA, the janitor would often shade me and move my garbage can right under my desk as a subtle indication that I was dropping too many crumbs like a toddler. Popcorn is such a great snack because it’s so light and fills your need to be chewing on something and you can do so for a long time because it won’t fill you up right away. Great for boredom, is what I’m saying. I also discovered this while on Whole30. It’s dried mango with no sugar, so it’s not like the Philippine dried mangoes you might get at Costco. Since it’s preserved without sugar, it’s “healthier” but it is also very tough. The first time I bit into one I was actually shocked. But, it grows on you. It almost becomes a game to find the best way to chomp a bit off and chew it. Also, because it’s so tough, you don’t stuff your face with them as quickly. It doesn’t sound great, but I’m just trying to lower your expectations. Buy these instead of fruit snacks. I can’t go back to regular Reese’s after this, which is sad because those used to be my favorite chocolates. Isn’t it funny how I’m such a snob to Halloween candy now? I made Andrew buy me a Twix bar a few weeks ago though and it was still really good. The thought of Halloween candy right now though sounds disgusting. These mini PB cups are the perfect pick me up when I’m feeling like I need a pick me up. They are the perfect amount of chocolate to give me an energy boost in desperate times. Two a day, with my morning coffee. That’s all. OK, so I’ve actually been taking these with me after work to eat after the gym, because protein, but they would be good work snacks too because they are like crackers! They are protein “wafers” that are covered in fudge-like material. They provide the lightness and crunchiness (like you get from popcorn) that one wants in a snack. It’s also nice to think that you’re being healthy buy eating something with “protein” but when you actually look at the ingredients it’s a little unsettling. I’m going to try some more bars, but I really like the texture of this one. As I’m typing this I realize that I should probably stock up on these teas because they stop stocking them after winter. Apple tea is really a fall tea, which I don’t get because it is good year-round. Apple tea makes me feel sooooooo cozy and puts me in a good mood. I like other teas too but this one is really my favorite. Of course, I have been bringing lunch to work and also bringing fresh fruits for snacks. I just don’t hoard them in my desk so I didn’t include them here. I’m always looking for new things to snack on so I’m very curious as to what other people keep in their desks. Besides nuts. We get it, that’s a work snack. Live a little!